Stemming from their understanding of equality, Quakers refused to be respecters of persons. They did not acknowledge titles, regardless of how many generations a dukedom could be traced back. They also did not bow or curtsey or show deference of any kind. By virtue of being human, the king had the same intrinsic worth as the laundress and was treated accordingly, with respect for the person rather than a list of noble titles. This, along with their refusal to swear oaths often led to the misconception that they were one step away from treason. Thank you so much, Kari, for this fascinating post! I had no idea the Quakers were so far ahead of their times when it came to equality and freedom. 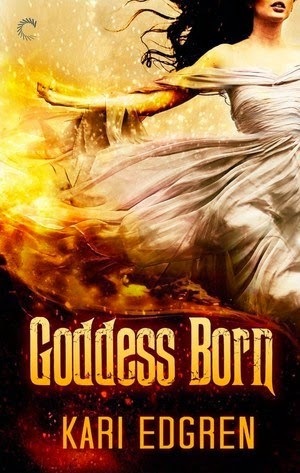 Be sure to come back tomorrow for my review of Goddess Born. And continue below for more information about the author, her novel and the other stop on the blog tour. a decent school system, Ms. Edgren managed to make it through elementary school having completed only one book cover to cover – The Box Car Children, which she read approximately forty-seven times. Things improved during high school, but not until she read Gabrielle Garcia Marquez’s One Hundred Years of Solitude in college, did she truly understand the power of a book.